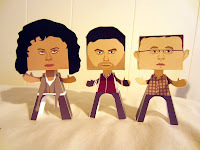 These paper people are from the Being Human TV series, the papercrafts are designed by sally. Being Human is a British supernatural drama television series. It was created and written by Toby Whithouse and is currently broadcast on BBC Three. The show blends elements of flatshare comedy and horror drama. It originally starred Lenora Crichlow as Annie Sawyer, Russell Tovey as George Sands and Aidan Turner as John Mitchell – all of whom are sharing accommodation and attempting as best as they can to live a “normal” life and blend in with the ordinary humans around them. In the third, Sinead Keenan became part of the main cast. In the fourth series, following the departure of Turner and Keenan and, shortly after, Tovey, the ensemble was joined by Michael Socha and Damien Molony. The first two series were set in in Totterdown, Bristol, and the third series onwards relocated to Barry, Wales.